Located just 4km away from the world famous St. Anton, Klösterle am Arlberg is a perfect ski holiday destination for those wanting to experience world-class skiing without breaking the bank. With family-run guest houses and personally managed hotels, the area is a shining example of Austrian hospitality – the perfect location for your next winter adventure! Here you’ll find essential information on the Klösterle am Arlberg ski resort as well as help and guidance in booking your transfer. At an elevation of 1075 meters above sea level, Klösterle am Arlberg is nestled in a spruce-covered valley directly at the foot of the world-famous Arlberg. As part of the Sonnenkopf ski area, Klösterle am Arlberg gives access to high-class skiing facilities for every skill level. Klösterle am Arlberg is easily reachable by train. The nearest train station to the resort is Langen am Arlberg, about 10 km from the resort, from which transfers can be arranged. In order to ensure you pay the lowest possible price for your journey, the price of your transfer will be based on a variety of factors. Alps2Alps pricing policy is designed to keep our fares uniquely affordable at all times. Even if you plan to visit Klösterle am Arlberg during high season, we still guarantee the lowest prices on all our services. The above-mentioned criteria will only ever result in our base-rate for ski transfers going down – we never over-inflate our prices at any time or for any reason. Unlike others, we take into consideration as many factors as possible to minimize our rates whenever possible. We always recommend booking well in advance, in order to access the very best deals and discounts. We also offer substantial discounts for off-peak, off-season and midweek transfers to Klösterle am Arlberg. If looking for the biggest savings, travelling midweek or outside peak season typically results in the best possible deals. We offer midweek (Monday to Friday) prices with up to 60% discount in comparison to weekend prices. Your transfer quota will also depend on vehicle availability, transfer schedule, vehicle utilisation and other costs like road tolls and airport parking charges. If you have any specific requirements or plan to travel as part of a larger group, please contact us directly so we can discuss your needs. The 8 km long Vermalen run with a 1300m altitude difference, the longest in the resort, is a challenge in itself. Sonnenkopf is also a favourite destination for free-riders. 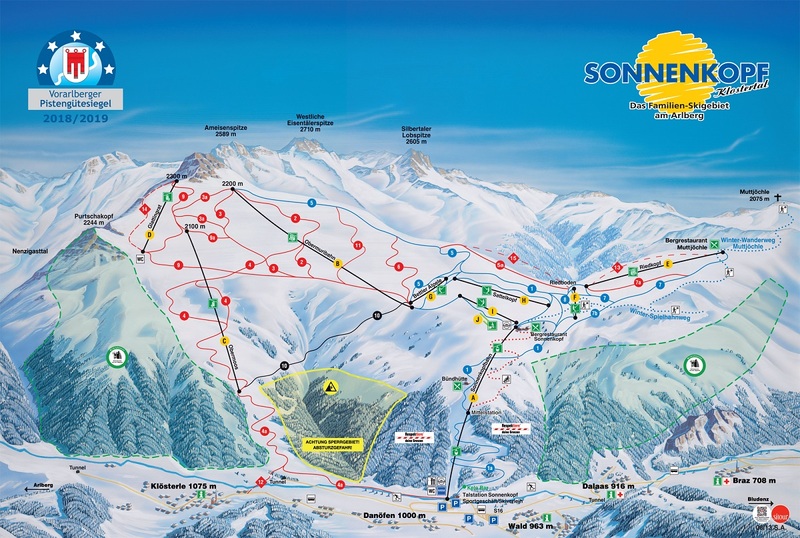 Sonnenkopf ski area is family friendly and suitable for beginners and intermediates who enjoy skiing a smaller an uncrowded ski area with quiet open slopes. The resort’s Snowman Land offers safe and exciting activities for the smallest winter holiday goers. The ski school in Klostertal runs useful courses, including freestyle and snowboarding classes. You can book a private ski instructor if the whole family is learning or improving their skills together. Here at Alps2Alps, we acknowledge your expectations when choosing a resort transfer company. You don’t just want us to take you there; you want to arrive on time, in comfort and for the lowest possible price. This is why we specialise in resort transfer services for the discerning traveller. If you’re looking for an unbeatable deal on your resort transfers to and from Klösterle am Arlberg, be sure to book well in advance. Don’t hesitate and get in touch with the Alps2Alps customer service team if you’re unable to find the service or destination you’re looking for on our website. Whatever your plans and needs, book your ski transfer with us and start your trip with ease!